First they came to take our land and water, then our fish and game....Now they want our religions as well. All of a sudden, we have a lot of unscrupulous idiots running around saying they're medicine people. And they'll sell you a sweat lodge ceremony for fifty bucks. It's not only wrong, its obscene. Indians don't sell their spirituality to anybody, for any price. This is just another in a very long series of thefts from Indian people and, in some ways, this is the worst one yet. They are discontented with their society, their government, their religion, and everything around them and nothing is more appealing than to cast aside all inhibitions and stride back into the wilderness, or at least a wilderness theme park, seeking the nobility of the wily savage who once physically fought civilization and now, symbolically at least, is prepared to do it again. The process is ultimately intended to supplant Indians, even in areas of their own culture and spirituality. In the end, non-Indians will have complete power to define what is and what is not Indian, even for Indians. We are talking here about a complete ideological/conceptual subordination of Indian people in addition to the total physical subordination they already experience. When this happens, the last vestiges of real Indian society and Indian rights will disappear. Non-Indians will then claim to "own" our heritage and ideas as thoroughly as they now claim to own our land and resources. Comment: The above applies not only to non-Indians who appropriate Indian ceremonies and beliefs, but also to non-Indians who simply dress up and act like Indians. By making "us" into "them," we blur the real distinctions. Playing Indian does not make someone an Indian the way it may make someone a cowboy. The early colonists, accustomed to life under benevolent despots, projected their understanding of the European political structure onto the Indian tribe in trying to explain its political and social structure. European royal houses were closed to ex-convicts and indentured servants, so the colonists made all Indian maidens princesses, then proceeded to climb a social ladder of their own creation. Within the next generation, if the trend continues, a large portion of the American population will eventually be related to Powhattan. While a real Indian grandmother is probably the nicest thing that could happen to a child, why is a remote Indian princess grandmother so necessary for many whites? Is it because they are afraid of being classed as foreigners? Do they need some blood tie with the frontier and its dangers in order to experience what it means to be an American? Or is it an attempt to avoid facing the guilt they bear for the treatment of the Indian? Belgian New-Agers conduct "sweatlodge" in "igloo"
Green Nations gathering conducts "purification lodges"
Nugent dons an "Indian" headdress and shoots a "buffalo"
Mardi Gras: "To be an Indian is a very special calling"
Sequoyah not a real Cherokee? 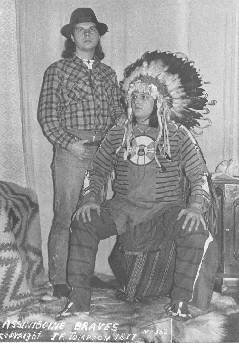 Traditions of the "Apache shaman"
"The current tribal 'chief' or 'chairman' was quoted...as stating 'one would think that to be a member of an Indian tribe, one would have to possess Indian blood.'" Being Indian "is an almost-instinctive ability, sort of a genetic racial memory."